The Tetragrammaton contained within the Clavicula Salomonis clearly shows the eight-pointed cross again. The eight-pointed cross actually exists of two separate four-pointed crosses that are superimposed. The text ‘Jesus Salvator’ (Jesus the Saviour) is the first reference to Jesus and connects the eight-pointed cross with the saviour of the World that would return at the End of Times. 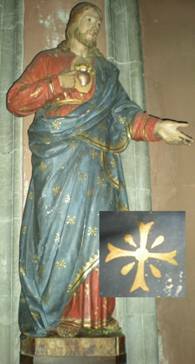 As mentioned before, in Christian art Christ is often adorned with eight-pointed crosses. The Tetragrammaton marks the four letters that spell the name of God ‘IHVH’ (Jehovah). The tilted square within a square is another way to express the eight-pointed cross. When the diagonals of the outer and inner square that touches the sides of the outer square are drawn, an eight-pointed cross emerges. Christ adorned in a robe with eight-pointed crosses. Notice they are two separate four-pointed crosses.